Имате въпрос към Kings Retreat Jodhpur? Независимо дали сте турист или пътувате по бизнес, Kings Retreat Jodhpur е перфектен избор за настаняване в Джодхпур. Хотелът се намира се на 02.00 Km от центъра на града, поради което неговите гостите могат безпроблемно да се наслаждават на всички градски атракции. С удобното си местоположение хотелът предлага лесен достъп до всички градски забележителности, които задължително трябва да се видят. Kings Retreat Jodhpur прави всичко възможно гостите да се почувстват удобно. Затова хотелът предоставя най-добрите услуги и удобства. Гостите на хотела могат да ползват съоръжения като 24-часов рум-сервиз, безплатен WiFi достъп във всички стаи, съоръжения за инвалиди, Wi-Fi връзка в общите части, паркинг. 07 стаи са разположени на 02 етажа като във всяка една от тях цари неповторимото усещане за домашен уют. Модерен комфорт с удобства като стаи за непушачи, климатик, отопление, бюро, балкон/тераса са на разположение в определени стаи. Освен това в хотела можете да се възползвате от множество предложения за приятно прекарване на свободното време. Когато търсите удобно и комфортно място за настаняване в Джодхпур, изберете Kings Retreat Jodhpur, който ще се превърне във втория Ви дом. The personal was nice and also the break fast. 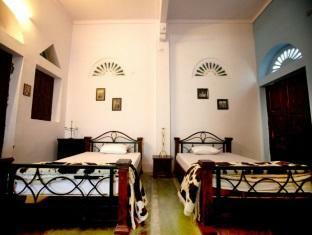 Rooms are big but lack basic amenities like no toiletries. Bed size was small. Food was ok but breakfast was worse. Just 3 options and that too tasteless. This place was spacious and spotless. In an excellent location for all attractions. Great roof top restaurant. Excellent team very helpful. The location is absolutely the best, there's only 7 rooms so they take good care of them, the roof top is a wonderful view of the Fort, great food, and the best part is the people that work there. they will quickly become your friends. It was my favourite guesthouse in India. THe location is great, but it is more of a hostel than a guesthouse. The rooms were tired and drab and the blankets were strange--acrylic. Didn't feel clean the entire time I was here. Bathroom is an over the toilet situation...maybe I'm just too old for guesthouses. Hotel is alright. The location is super awesome. Staff is friendly and helpful. This aint a super deluxe suite kinda place but the rooms are clean with a big bed, good linen/sheets, AC, a dressing mirror (whoch could be full length) and the bathroom is simple bathroom, no bath tub, clean tiles, clean bucket, mug, geyser and sink. Hygenic all in all. No other roof top in Jodhpur can match this one. Not elite but cozy. The place is value for money. I recommend. It is a little interior. So if you are going by personal car, not recommended. Excellent staff. Neat and clean hotel. Location was good too. Need to work on their restaurent and waiters. we stayed for couple of days. Its great for back packing or otherwise. Please do not expect to have amazing facilities. it a simple hotel with simple rooms. clean and hygienic.. Staff is helpful and food is ok..I would rather prefer to eat out but for lazy guys, enough things are available. Most Important thing is its location..walking distance from alot of good places. Amazing view of Meherangarh from the terrace. Markets are near by so google it up before you hire cabs or ric's. Overall we had comfortable stay and good sleep. I would say you get what you paid for, but I paid just 200 extra for another hotel in udaipur and that was swell. Here bathrooms had a strange gutter like smell. At nights there was no staff at counter or near gate..no security. Cars barely manage to reach this place. Lanes are dingy and horribly dirty. DO NOT think of walking on these lanes. Restaurant food was good but it was on second floor, there is no lift and steps were too steep. I won't recommend it for older people. Rooms looked clean and bed was comfortable to sleep on. But with withering walls, cheap bamboo mat interiors and smelly bathrooms, the rooms lacked any appeal whatsoever. I am not a very picky person in general with hotel rooms. But this room was just not for me. I was happy to be remain outdoors for as long as I could. 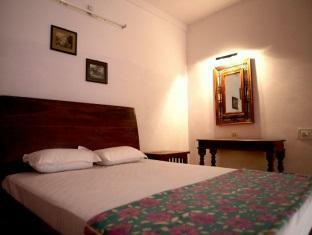 Wonderful rooms, friendly staff, convenient location and good rooftop restaurant. A real find! After travelling for a couple months and being in India for a month we luckily stumbled upon king's retreat. We were supposed to stay for one night but ended up staying for 5. The people, the vibe, the food at the rooftop restaurant are just amazing!!! I felt like I was home!!! Vishal and happy and Raju were so hospitable and cared about your stay. This is THE place to stay in jodhpur!!!! 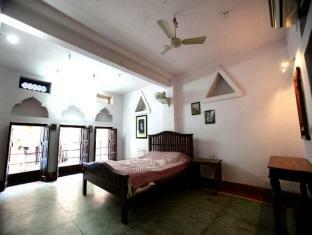 its a good heritage haveli with friendly and caring staff. location is very close to the mehrangarh fort( trek route) and the clock tower. the area is also dotted with some famous restaurants of jodhpur serving local as well as international cuisine. the rooms are huge in size even for a couple. neat and clean. they also have a restaurant on the terrace top floor by the name of dagley the lounge , if im correct and the food is quite decent as well. we tried the thin crust pizzas as well as some continental cuisine and it lived up to our expectations. all in all a nice comfortable stay. would recommend to friends. staff was excellent, location is little interior but manageable Some up-gradation like TV to the rooms will surly increase the rating.Roof top restaurant is also fine & the view to the fort looks amazing. The staff were genuine, honest, friendly and helpful. They put us in contact with two excellent drivers when we went to Jaisalmer. Excellent. They were welcoming and hospitable and helpful. I would absolutely recommend them. Lovely stay, big room, well decorated, outdated but clean and big bathroom. Hotel is beautiful style old building. Breakfast area a bit shabby, could do with a fresh paint, roof terrace wonderful with perfect view on the castle, ideal for dinner and late night drinks. Popular establishment. Perfect location. Wonderful service, staff went out of their way to make us happy. Personal attention of the management is commended, the pampering really makes the stay worthwhile. No daily cleaning of the room. If that would be the case I would certainly rate it as a 3-star (or more) hotel.